While it’s always up for debate whether there’s actually an off-season or not, one thing is clear - before we know it, it’s going to be summer break. Kids across the nation eagerly await this several month time period where they can enjoy warm weather and all of the shenanigans that their hearts desire. For youngsters who are just as obsessed with disc golf as their parents are, that means more time on the course. But how exactly can you best support your kids when they have big dreams within the sport? It partially depends on their age, what their goals are, and how much time and money you’re able to spend. Let’s dig in and take a brief look at ways you can incorporate disc golf into your summer plans. During the school year, it can be tough to get as much disc golf in with your kids as you’d like. Between homework, after-school sports, and the responsibilities that parenting entails, heading out to the course can sometimes become an afterthought even if everyone is super obsessed with the game. Factor in daylight savings time and playing regularly can seem like a long lost wish. This summer, take the time to make a plan for disc golfing that everyone can agree on. While going out every single day sure sounds like fun, there are other responsibilities that will likely come up. Whether it’s five times a week or only on the weekends, sit down and actually talk about when and where you’d like to go. Not every kid wants to be the next 1050-rated player, and that’s totally fine, but it’s important to talk with your child about what they do envision for themselves. We’ve all seen the parents who aggressively coach their kids from the sidelines during a sport that they care about more than their child does, so it’s crucial to not take this same approach with disc golf. Do they want to go on a mini summer tour and play in as many kid-friendly events as possible? See if you can make that happen. What if they want to become the next World Champion? Then a more focused practice schedule along with tournament play might make more sense. Depending on your child’s age, how you tackle their hopes and dreams will also make a huge difference. If they are 9 years old and want to throw 400’ then you can take them to do a lot of field work and focus on their form at this young age. Older kids who are just starting out in the sport might find that a mix of casual rounds and tournament play will better suit their needs. Ultimately how you support your kids in their disc golf dreams will be entirely up to you, as each kid and each family dynamic is different. 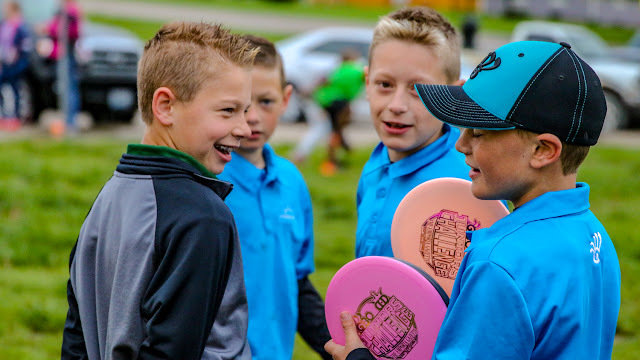 Above all else, it’s important to remember that young players are the future of this sport, so if we want to see disc golf really take off to another level, it’s up to all of us to support the kids who love it. This is a great for a father looking at taking the time with their kids to enjoy disc golf. I have three kids and only one of them is really into it, so having to balance that and spending time with the other two on what they enjoy is something else I'm having to work with. Just ordered a stack of putters from DD for the one that really wants to get into it. We have a great program being run in Perth for kids weekly. Being run by the same guys behind RAD and DUDE. Great to see the community getting involved!